It’s important for both kids and adults alike to spend ample time outside each day. One way to get some fresh air and exercise is to grow a garden with the kids. We’ve compiled 100 tips that will help you not only garden with your kids, but learn right along with them. The trick to making gardening fun for kids is to find plants that are fun to grow and that grow quickly. These 10 plants are fast growers, so the kids won’t have to wait long to reap the fruit of their labors. Snap Peas. Northwest Edible Life recommends planting a sugar snap pea in your garden for the kids. The seeds come up in only two weeks and in a couple months the kids will be able to start picking and eating them, shell and all. Carrots. These seeds are quick growers that will need thinning. Thinning will give the kids something to do soon after planting the seeds. US News suggests carrots for kids because they are sweet and grow quickly. Strawberries. Instead of seeds, you and the kids will need to plant starter-plants to speed up the process. First the plants will flower and then put on fruit. Strawberry plants are fascinating to watch and delicious to pick when ripe, says Inhabitots. Lettuce. There are many types of lettuce, says BBC, but leaf lettuce is simple to grow and should sprout from seed in about 12 days. You can harvest a little lettuce at a time and it will continue to grow for months depending on where you live. Herbs. You can start the seeds inside or out, according to The Art of Simple. Herbs are another plant that grow quickly and you can harvest a little at a time and grow them all season. Beans. These seeds grow very fast and are considered ‘runner’ beans because they are vines. Green Child Magazine suggests training them to grow up poles in a teepee shape or up a trellis and then let the kids “hunt” for them. Pumpkins. According to Weekend Gardener, pumpkin seeds germinate in about a week and the vine and leaves begin growing quickly along the ground. Cherry Tomatoes. House Logic explains that cherry tomatoes should be started by seed inside or planted as starter plants outside. Cherry tomatoes are perfect for kids because they produce a lot and are simple to harvest. Sunflowers. Organic Growers School suggests growing sunflowers from seed because they are reliable and quick growing, so kids will not become bored as quickly when watching them. Nasturtiums. Home Guides mentions how quickly these flowers bloom from seed and points out that the blooms are edible and can add interest to a salad. Before you begin planting your garden you’ll want to start planning it. Take the ideas found on these 10 blogs to kick off the planning process, then get to growing! Make a poster board plan. 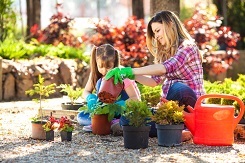 Kids Gardening suggests collecting magazines, newspapers and craft supplies to create a garden layout on a poster board. Downloadable plans. If you don’t feel able to create your own garden plan, use the plan for a 6 foot by 6 foot garden from Better Homes and Gardens. Planning for space. Colorado State recommends that you keep in mind the available space you have for a garden or containers and the age of the kids when planning. It may be smarter to do a small area with a few plants for a young child so that they don’t get overwhelmed. Gather seed catalogs. Most seed companies will mail you catalogs for free if you sign up online, according to Playful Learning. Let the kids look through the catalog to get ideas of what to plant. Make a bean hut. If space is limited or you don’t want to commit to a big garden plot, create a combination shade structure for the kids and a bean hut like the one on Paint on the Ceiling. Create paths. Heirloom Gardener shares 10 suggestions for creating a kid-friendly garden plan, such as creating pathways kids can walk on to avoid trampling any plants. Plan your area. The Well Fed Homestead explains how she allows her sons to have their own two foot by nine foot row in her garden. During planning stages she cut a two foot by nine foot piece of butcher paper and used 12 x 12 sheets of paper to plan their plants. Create an alphabet garden. The Micro Gardener explains how you can tie in learning the alphabet with gardening. Use a hula hoop approach. My Kids’ Adventures explains how to use a hula hoop as a spatial guide for planting a salsa or pizza garden. Create a garden wish list. Have each member of the family pick some plants that they want to grow in the garden, then draw up a planting plan, recommends She Knows. If you begin early enough, you may have time to start some seeds indoors and then move them outside as the weather warms and they begin to grow. Follow the suggestions in these 10 tips to start some seeds inside. Find the average last frost date. Get Rich Slowly recommends figuring out the last average frost date for your area and counting backwards to give the seeds 6 to 7 weeks to grow into seedlings before transplanting them to your outdoor garden. Buy your seeds and starting supplies. Organic Authority provides a list of the items that you will need to get started planting. Determine what medium you want to use for planting. You can buy seed starting mix, use peat pellets or make your own potting mix by mixing together top soil, compost, peat and vermiculite. Vermiculite is the least expensive way to go, says Yahoo Voices Gardening. Create plant labels. As you sow the different seeds you will need to mark what the seeds are using a plant label of some sort. Kids can make labels for each seed using craft sticks, as shown on Family Theme Days. Moisten the potting mix before planting. About Gardening explains how to dampen the potting mix without over wetting it. Cover the containers with plastic wrap. Your Easy Garden suggests putting plastic wrap over the tray once you’ve planted the seeds to create a warm moist environment for the seeds to germinate. Use a mister to water seeds. Mother Earth News explains that as soon as the seeds start to germinate you need to remove the plastic wrap and water the soil with a mister whenever it gets dry to the touch. Go from dark to light. According to Simple Bites, seeds need to germinate in the dark, but after the seeds germinate you need to move them to a sunny spot. Transplant seedling to larger pots. Cleveland suggests transplanting seedlings from the starting tray to their own little pot after the first true leaves appear. Harden off your seedlings. Thrifty Fun explains that once overnight temperatures reach about 50 degrees you can start putting the seedling out for a few hours a day, gradually increasing the time until they are strong enough to be planted in the garden. Whether you are a new or experienced gardener, you need to understand the importance of compost in your garden. Master gardeners call compost ‘gardener’s gold’ because of how helpful it is in gardening. Learn all about composting and how to do it by reading these 10 posts. Teach the kids what biodegradable means. CVS WMD describes what it means to be biodegradable and how that relates to composting. Learn about greens and browns. eHow has an indoor, kid-friendly demonstration that will help to explain the difference between brown and green matter and how compost needs both to decompose. Why is composting important? The Garden of Oz explains how composting helps the garden and the environment by reducing your carbon footprint. Composting do’s and don’ts. Read about the different items that make up browns and greens and which items should never be put into a compost pile according to Green Education Foundation. Water and air are vital for compost. As you are building your compost pile, water each layer and then continue to water the pile to keep it moist. Turning the pile will then incorporate air, causing the pile to ‘cook’. Mother Earth Living explains more about compost piles and a book called Compost Stew by Mary McKenna. Pick a location for your compost pile. NW Bloom suggests finding a place to put your compost tumbler or pile in the yard. It’s also important to designate a place to keep kitchen scraps that will be added to the compost pile. Build a compost bin inexpensively. Kid Pointz shares how to use chicken wire to create a simple, effective compost pile. Pile size is important. According to Family Gardens, you shouldn’t make your pile much bigger than 3 feet tall by 3 feet wide by 3 feet deep, or a cubic yard. Check into red wiggler worms for composting. This worm can speed up the composting process or can be kept inside to compost kitchen scraps, says Bedford 2020. Use your ‘gardener’s gold’ in the garden. Compost reduces the need for additional fertilizer and helps lessens the need for watering. Natural Resources Defense Council says it also helps eliminates the need for pesticides. You’ve bought your plants, you’ve prepared your garden or container and you are ready to plant. But before you start planting, you need to know the requirements for planting different plants. Check out these 10 blogs for different planting tips. Planting in rows. Use two stakes with string between them to ensure that the rows are straight as you plant them. Sunset explains how to use the string as a guide when making furrows to plant the seeds. Planting in mounds. Bring soil from each side of the row and then mound the dirt over the seeds in the middle when planting, recommends Home Guides. Making a hideaway. Vegetable Gardener points out that if you want to make the perfect sunflower hut for your kids you should use the super tall varieties of sunflowers. You can find varieties listed by height on this site. How deep should seeds be planted? Every seed is different when it comes to planting, so it’s best to check the seed packet if you have one or use the tips found on eHow. Testing the soil. According to NCAGR, you should take a soil sample and send it in a couple months before starting your project so you know what you need to do to amend the soil. Amending the soil. Based on soil test results, you will need to add things to your soil to balance the pHl. HGTV Gardens explains different things you can add to change the pH to make it more acidic or more alkaline. Hula hoop planting. Seeds in the Middle tells kids how to plant the plants needed for making salsa, pizza or salads inside of a hula hoop. Starting the garden with seedlings. The Almanac explains how to plant seedlings in a garden. Train the plants to grow up. J Daniel 4’s Mom shares how kids can create a spider web trellis to train a pea or plant so that it climbs upward. Vertical plant to save space. Garden Dad describes in detail how to plant beans by tying three poles together like a teepee over the seeds/plants so that they can grow vertically. Planting is the first step to creating a garden, but the work doesn’t stop there. You will need to actively tend to your garden to keep it alive and thriving. Use these 10 tips to tend your garden with the kids. Kid-sized tools are important. Garden Guides reminds parents that kids can get hurt if they try to use equipment that is too big for them. Find small gloves and tools for kids to use. Let kids dig. Aggie-Horticulture suggests having many different things for the kids to do in the garden so that they don’t get bored. Digging usually holds their attention. Give your child his own garden plot. If you don’t have room to give him his own garden, give him a section of yours, suggests Mother Nature Network. Mulch your seedlings. Katie’s Krops suggests mulching your vegetable garden with hay or straw right after you plant them to protect the plants and keep down the weeds. Let the kids add plants to attract butterflies. Aha! Modern Living suggests getting the kids interested in the garden by letting them have their own space and planting fun plants that attract beautiful butterflies. Be careful when weeding. Kids USA explains that weeds can choke out your plants and steal the nutrients. Model garden tasks for your kids. Kids learn from you, so if you are working in the garden invite them out to watch and help, suggests Garden. Give kids a job. DIY Natural suggests giving each child a job, explaining it, supervising it and approaching it with realistic expectations. This will keep them busy and happy. Only help when needed. Let the kids do what they can and help when needed, recommends Whole Home News. Include familiar things to play with in the dirt. Gardening Know How suggests letting the kids play with large spoons, measuring cups and bowls in the garden. If you don’t have a big backyard with room for a garden, try your hand at container gardening instead. These 10 articles will explain how to choose the right items to put into a container, how to choose the right container for your plants and much more. Limit your child’s crop choices when container gardening. A Busy Mommy explains that kids may be tempted to overplant their pot without some guidance. Plant an herb container garden. Herbs are simple to grow, according to The Honest Company, and are perfect for kids. Allow the kids to pick their own containers. Do It Yourself explains that kids want a sense of ownership with their container garden, so let them pick their containers as a first step to achieving this. Choose the right container for the chosen plants. The Greenery says that terra cotta pots breathe, so the soil dries out quickly. This is great for plants that don’t like wet feet, but other plants do better in plastic with a moister soil. Place a layer of pebbles in the bottom of the container. Green Guide for Kids explains the steps to preparing your container for planting. Combine several plants in one container. If you have a large pot, plant several plants in it. Vegetable Gardening Online recommends planting a tomato plant with a border of chives. Choose a sunny spot for your container. Vegetable plants need sun, so Guilford recommends putting vegetable containers in places that get a lot of sunlight. Fill the container to within one inch of the top with potting mix. According to Community Ground Works, a soil-less potting mix works best in containers. Flowers grow well in containers. Hub Pages shares a list of flowers that do well in containers and may involve less tending. Make a list of responsibilities. Scholastic recommends making a task list for all of the things that need to be done with your garden. Companion gardening allows you to control bugs without the use of chemicals, can help plants thrive and can keep wildlife out of your garden. Read these 10 posts to learn more about which plants grow well together and which plants don’t. Plant corn seeds, pole beans and squash together. La Costa Valley Preschool explains that corn stalks give beans something natural to climb on and squash acts as a natural mulch to keep down weeds and hold in moisture. Learn which plants grow well together. One Creative Mommy has created a chart that shows which seeds or plants help each other and which you should not plant together. Find out which plants don’t grow well together. Moms Need to Know explains that sunflowers don’t grow well with other plants because their roots emit a toxin that prevents other plants from growing too close to them. Carrots are simple for kids to grow and can be planted with leeks. According to Kiddie Gardens, carrots are bothered by the carrot fly, so planting leeks or onions near carrots will keep the carrot fly away. Companion planting even has a biblical tie in. Encyclopedia Kids details the origins of companion planting, referencing Leviticus 19:19 where scripture describes nurse crops. Inter-planting is different from companion planting. Edina Patch explains that inter-planting is planting cold and warm weather vegetables in the same area to make the most of your garden space. Companion planting is planting seeds at the same time to benefit the plants in one way or another. The legend of the three sisters. The Three Sisters tell about Iroquois Gardens and how it was believed that a spirit inhabited the maize, the pole bean and the squash and that each sister would protect the other. This is how the idea of companion gardening began. Some companion plants are said to affect flavor. According to About Gardening, there is little scientific proof of this, but it can be a fun experiment to see if it’s true. Plant marigolds around your vegetable garden. The Old Farmer’s Almanac says that farmers have used marigolds for years to keep insects and animals away from vegetables. Grow nasturtiums with your squash. The Free Range Life explains that the nasturtium flower keeps the squash bug away. Instead of using pesticides to keep harmful bugs out of your garden, consider planting things that attract the beneficial bugs. Peruse these 10 sites to find out which bugs are good and which ones are bad when it comes to gardening. Bees are necessary to pollinate plants. Bees are necessary because they pollinate the plants and help the vegetables grow, says Hobby Farms. Aphids are bad. Check out the picture of what a plant suffering with Aphids looks like on EPA. Ladybugs love aphids, so buy and introduce ladybugs to your garden. Butterflies can be both good and bad. If you are trying to attract butterflies to your garden or need pollination to occur, then butterflies are good says Lewis Ginter Botanical Garden. However, butterflies lay eggs that turn into caterpillars, which eat the leaves on plants. Hoverflies are good bugs. Oregon State University suggests planting cilantro in your garden to attract hoverflies, which eat aphids and other bad bugs. Damsel bugs are beneficial. These bugs look strange, but they attack and eat destructive Japanese beetles, says Gardens Alive. A Syrphid Fly Larva is a strange looking, good bug. Mother Earth News describes this bug as a sightless little green worm that moves quickly and eats aphids. Dragonflies are beneficial. Real Estate MSN explains that dragonflies eat mosquitos, aphids and other garden pests. Ground beetles eat slugs. Garden Weasel mentions how tempting it is to step on ground beetles when you see them, but they actually do more good than harm in the garden. Ants are good, even if they are annoying. According to Alive, ants can eat bugs as large as caterpillars and should be welcome in your garden. They can bite, though, so be sure to protect your skin with gloves when working in the dirt. Colorado potato bugs are destructive bugs. Mama Knows explains that these bugs can eat entire leaves, leaving only the veins. It can be challenging to garden with kids, there’s no doubt about it. However, the benefits that the kids gain far outweigh the negatives. Read through these 10 tips for helpful suggestions to make the gardening experience a successful one. Kids love crops that mature quickly. Earth Easy suggests harvesting radishes because they produce quickly and can be started in cool weather. Don’t worry if the kids don’t do things the way you would. How Does She stresses the importance of getting kids to love the experience and make it their own. Keep a garden journal with your child. Keep a journal that tracks what worked and what didn’t in your garden and encourage your kids to draw pictures of the plants, suggests Lemon Lime Adventures. Let the kids help in the garden, but don’t force them. The Cubicle Chick explains that you don’t want kids to think of gardening as a chore or something they ‘have’ to do. Instead, invite them to help and lead by example. Make a simple watering jug for little gardeners. A Journey to a Dream shares how to create a simple watering jug by using a hot needle to create holes in a milk jug cap. Show a child how seeds germinate. The Artful Child has a bean experiment that allows kids see how stems come out of a bean. Grow strawberries in cement blocks. Check out Pink Country Home to see how simple it is to do this around the edge of your garden. Make a compost sifter for the kids to use. My Backyard Plans explain how simple it is to make a sifter using wood scraps and wire mesh. If you are going to do a compost pile, you may want to have a sifter to filter out the big chunks. Harvest the sunflower seeds with the kids. The Educator’s Spin on It shows a video on how to harvest the sunflower seeds; keep half to feed the birds and half to plant the following year. Let the kids add sound to the garden. Appeal to all senses in your garden by making a wind chime like the one found on Cindy Dyer.